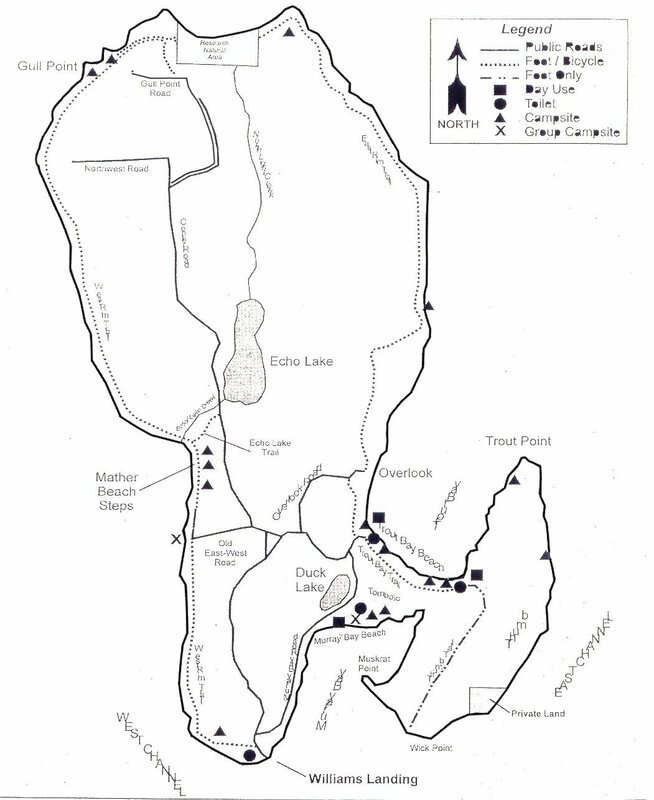 Grand Island is located about a half mile from the mainland near Munising, Michigan. Originally owned by the Cleveland Cliffs Mining Company, the island has now been designated as a National Recreation Area. This large island of 13,500 acres is covered in hardwood forests and has a beautiful shoreline, ranging from sheltered bays with sand beaches to towering sandstone coastal cliffs that rise over 200 feet from the water. Many of the cliffs have been carved by the elements, forming sea arches and sea caves. For non-paddlers a ferry run by the National Forest Service, which makes four trips a day in summer months, is available from Powell Point. The island has many dirt roads and trails for hikers and mountain bikers. Spectacular sea cliffs, arches, and sea caves; lovely sand beaches; hardwood forests, and many hiking trails. Paddling around Grand Island's northern half is hazardous. The coastline is lined with over 200 foot sandstone cliffs that descend directly into the water with no place to beach a kayak. Most storms come from the northwest so you are fully exposed to the winds of Lake Superior. There are few places other than North Beach to land if an emergency situation arises. The east side of the island (the thumb) also presents the same situation. Even though Murray Bay and Trout Bay are sheltered depending on the direction of the wind, the channels and Munising Bay may be rough. Grand Island National Recreation Area.